What does Group A mean to you? I can’t really say I paid much attention in the heyday of Group A. I was old enough to notice, and old enough to care about racing, but since I was in the US, it’s just not something we got a chance to see here in the 1990’s. The FIA or Federation Internationale de l'Automobile introduced Group A in 1982 to replace modern touring cars, and Group N to replace standard touring cars. Normal FIA Group A requirements stated that a minimum of 2500 cars had to be produced to qualify, until 1991, then 5000 were required as a minimum. The FIA however allowed Evolution models to be homologated with a minimum of 500 cars like the Nismo Nissan Skyline GT-R(560 produced). Check out some of the Group A and Australian touring car videos above. 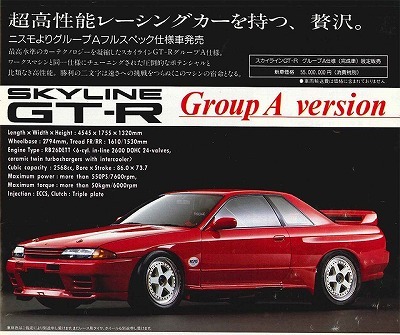 Below, there is also the first 5 pages of the FIA Group A Homologation paperwork for the Nismo R32 Skyline GT-R. There were three divisions within Group A, Division 3 for cars above 2500cc, Division 2 for cars with engine displacement between 1600 and 2500 cc, and Division 1 for cars with less than 1600cc displacement. Group A was phased out in 1994, when German DTM switched to a 2.5 liter engine formula. In Japan the Japanese Touring Car Championship switched to what would eventually become JGTC and then Super GT. Australian touring car switched to a V-8 formula in 1993, which became V-8 Supercar. The series that used the Group A formula.